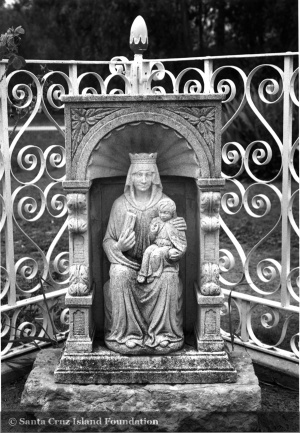 This intricate statue of Madonna and child in the southwest corner of the cemetery marks the collective graves of the Stanton family. Individual bronze plaques mark the graves. In 1978 the graves of island workers, Angelo Forno and Tomas Sansoni were relocated from Prisoners' Harbor to the chapel cemetery. Simple wooden crossses marked their graves and were relocated as well. Angelo Forno had an additional stone marker topped with a cross at the foot of his grave. The grave of Edwin L. Stanton, Jr. was originally a cenotaph only. 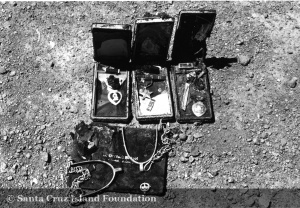 When his remains were relocated to the island cemetery in 1988, personal items previously placed in the grave by Carey Stanton were found. Items placed in the grave of Edwin L. Stanton, Jr. included his spurs and track and war medals. 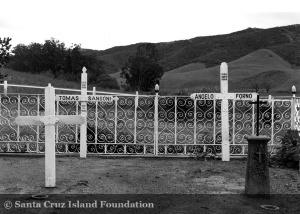 Cemetery of the Island of the Holy Cross, Santa Cruz Island is the only historic cemetery within Channel Islands National Park. It surrounds the chapel on Santa Cruz Island on the west and south sides. It was created in 1972 by Carey Stanton when stored lengths of 19th century wrought iron fencing from the Caire era were used to create its boundaries. Some of the burials were relocated from other cemeteries. Fourteen people and at least six ranch dogs have been interred. Carey Stanton moved five of his relatives from Inglewood Park Cemetery in Los Angeles to the Santa Cruz Island cemetery in 1978. 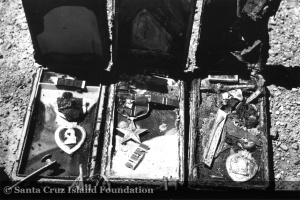 The Santa Cruz Island Foundation moved the remains of Carey’s brother, Edwin Jr. to the island cemetery after Carey’s death in 1987 as were his wishes. The Stanton family plot in Inglewood Park cemetery still contains his paternal grandparents, paternal uncles, and other relatives, guarded by a monolithic marble statue of an angel. » Daily, Marla Cemetery of the Holy Cross in Santa Cruz Island Foundation Occasional Paper #5, 1991. This page was last edited on 18 June 2015, at 13:21.